For readers who loved Francine Rivers’s Mark of the Lion series comes a survival story about faith, love and the Big Questions of Life. 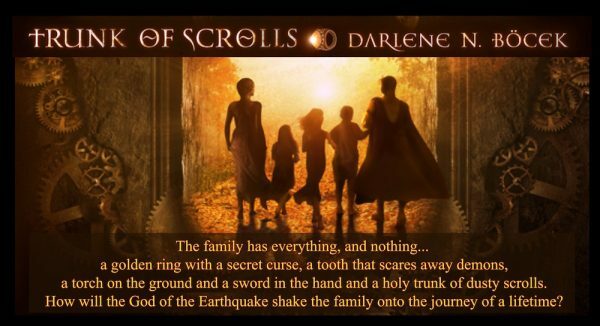 “The entire time I was reading Darlene Bocek’s book Trunk of Scrolls I could picture it being such a wonderful family adventure film.” Goodreads reviewer. This brilliantly detailed, fast-paced historical quest is enjoyed by Christians of all ages. Families. Men. Women. Grandparents. Young Adults. “Our six year old son loved [this and] begged us to keep reading way into the night.” Amazon reviewer. What kind of God would allow earthquakes to pummel Antioch to the ground? Why did his uncle Gaius Justus disappear? Can he stop their their reckless trek to Constantinople? Is his sword-skill enough to protect the family through bandit-infested Anatolia? Should he keep his secret safe, when silence will trap Byziana? Is his torch bright enough to show the way? A cursed ring… His hidden love for bold and daring Byziana is complicated by one minor fact–she is betrothed to sword-wielding Belisarius. Exposing the truth about the wicked man will lay open Marcellus’s deepest, darkest secret. For young adults who want to dive into a Byzantine quest…For families who want to adventuretogether… For romantics who love to time-travel to “another time and another place“… For questioners who want to know why bad things happen to good people. ‘Trunk of Scrolls fell open and I fell in, and throughout the adventure, mystery, drama, action and romance, I found myself lost in the author’s world and deeply attached to and caring about her characters. They became my friends; I hated her villains and loved her heroes and heroines…MY heroes and heroines. Their stories thrilled my soul and warmed my heart for many weeks after I finished the book.” First reader, Goodreads. Trunk of Scrolls is a “on the edge of your seat” survival story. If you like fast-paced adventures, spontaneous young heroes, suspense-filled plots, and a dash of romance, then you’ll love Trunk of Scrolls! Good for the whole family! Great for a curl-up-on-the-bed read. BUY it today! Take and Read!